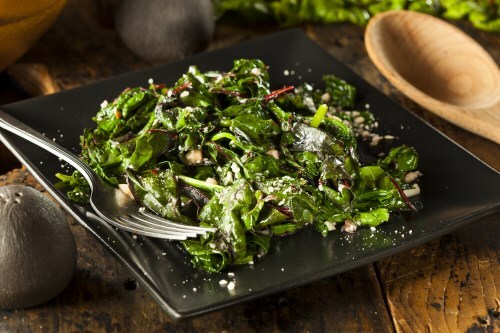 Wash the Swiss chard and cut into 1 inch strips. Separate the thick and tough stalk sections from the upper leafy strips. Bring the water and 1 tablespoon of salt to a boil in a large saucepan. Cook the stalk sections in the salted boiling water for 2 minutes. Stir in the leafy strips and cook until the leaves are wilted and the stalks are fork tender, about 6 minutes. Drain and set aside. Heat the extra virgin coconut oil, garlic, and red pepper flakes in a large skillet over medium heat until aromatic, about 3 minutes. Add the drained Swiss chard, cook and stir for 2 minutes; season with salt to taste.